Jewish architect Stanley Saitowitz approached the design of Hillel House at Drexel University in Philadelphia as an insider with in-depth knowledge of Jewish culture. Saitowitz is a Jew from Johannesburg, South Africa, where he graduated with a degree in architecture before going to work in California. His studio is now based in San Francisco. Drexel University, a privately owned university known for its scientific research, asked the architect to design a new Jewish cultural centre for students. The financiers wanted to attract more Jewish students to Drexel with a highly recognisable local landmark. The search for a formal identity led Saitowitz to explore Jewish life, in which images are prohibited by a traditional association with idolatry. There are very few visible signs and symbols of Jewishness: one of these is the menorah, a seven-armed oil lamp which was used to burn consecrated oil in the Temple in Jerusalem. Saitowit’s other religious projects aim to interpret the image of the menorah in a contemporary way, as in Beth El synagogue in La Jolla or the New England Holocaust Memorial in Boston. The vertical rhythm of synagogue walls, the succession of glass towers in the Boston monument, and the main façade of Hillel House at Drexel all allude to the menorah. But they do not attempt to become a metaphor for it on an architecture scale, to reproduce its size, proportions and shape on a larger scale. The process of symbolic association transforms an image into a symbol conveying a sense of belonging. 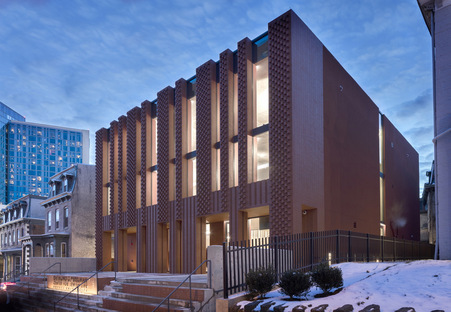 It is precisely this sense of belonging that was the goal of the new Jewish centre for students, without any form of iconography in the architecture. And yet Saitowitz’s project is profoundly recognisable as belonging exactly where it is. The brick that “weaves” its outermost skin is the characteristic building material of Philadelphia. Its grand staircase is a larger form of the staircases in the Victorian homes that may still be found on 34th Street and in the neighbourhood of Drexel. But the brighter monochromatic red and the pattern in relief on the walls make the new building stand out on the street with an identity of its own, as a landmark for the community. Made up of irregularly alternating solid brick and hollow glass, it has been compared to a drape over the menorah, symbol of Judaism, which in some traditions represents the burning bush from which the voice of God came to Moses on Mt Horeb, while others see it as representing the six days of creation, with the sabbath in the centre. For the citizens of Philadelphia, the wall is all about light, contrast and solidity, the qualities of a true landmark. This façade delicately dotted with bricks in relief, changing slightly in form depending on the time of day, is only one of the many levels on which the interior may be accessed. Beyond the staircase that rises up the volume and this façade, which is in actual fact a colonnade of irregular pillars, is a wall with big, tall windows. Once inside, we are already in the heart of the building, an open space bounded by four big square pillars containing a staircase. All around this floor are the service areas, the coffee shop and lounge, places for students to meet and talk, and to celebrate with a kosher dinner on Friday evenings. Upstairs are the offices, study halls and laboratories, while the top room contains prayer rooms. The layout of the three levels above ground is arranged around the space formed by the four columns, where the grand staircase on the ground floor also acts as a little amphitheatre for internal meetings. There are no images in these interiors, as we have seen, other than a star of David. But there is a palpable sense of Jewishness in the irregular motif on the wooden railing defining the space occupied by the staircase, inspired by the strips decorating Jewish prayer shawls; or in the colours of the walls of the prayer rooms, burgundy and royal blue, like the leather covers on Jewish prayer books. But apart from this, the rooms are multi-purpose spaces, places of study which can be converted for other uses as required.